NIH conducts clinical research studies for many diseases and conditions, including cancer, Alzheimer’s disease, allergy and infectious diseases, and neurological disorders. 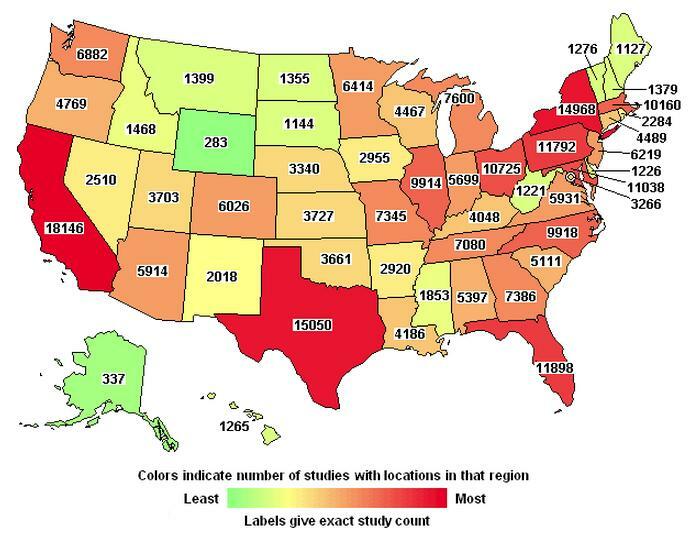 What’s more, this work is being carried out in every state of the nation, as you can see from this interactive map showing clinical studies supported by NIH and others. Before you start exploring this map, let’s take a moment to review the basics. A clinical study involves research using human volunteers that is intended to add to medical knowledge. One common type of clinical study, called a clinical research trial, looks at the safety and effectiveness of new ways to prevent, detect, or treat diseases. Treatments might be new drugs or new combinations of drugs, new surgical procedures or devices, or new ways to use existing treatments. If you’re interested in taking part in a clinical study, a terrific place to start is ClinicalTrials.gov, which is a service of NIH. This searchable database lists more than 139,000 federally and privately funded clinical studies in the United States, as well as around the world. For each study, the database provides information on the purpose of the research, who may participate, where the study is being conducted, and who to call or e-mail for more details. To help you in your quest, we’ve pulled together some handy search tips, along with some real-life stories from both volunteers and researchers. Finally, please keep in mind that ClinicalTrials.gov is just a starting point. Any information that you find there should be used conjunction with advice from your doctor or another health care professional.